Now I have had time to look further into Labour’s performance in the local elections a rather extraordinary picture is emerging among the losses and gains made by Labour on the night. The election has been presented as a boring status quo result but if you drill down into the figures it shows two rather extraordinary trends – Labour is losing among the UKIP more Brexit minded white working class voters to the Tories but making major progress in some of the most affluent areas that stayed Tory strongholds even under Tony Blair. Probably one of the most striking results was in Westminster. Now Labour failed to make the huge headway – just gaining four seats overall though they narrowed the gap between Labour and Tory across the borough to 1.8 per cent. The Tories held the one seat they had in Pimlico after a defection last year. Labour took one of three seats in the West End ward – covering Mayfair, Soho and Fitzrovia in Central London. What’s more the person who won – Pancho Lewis- did so with a by-election style rise in votes. In 2014, the party’s candidates received a total of 1,281 votes and this year the figure stood at 2,858 – more than the 2,831 votes for the three Conservatives. This means that Oxford Circus, Park Lane,Bond Street, Grosvenor Square, the Dorchester hotel, Savile Row, Regents Street and for that matter the editorial offices of Private Eye are represented by a socialist. Since the ward was created in 1978 Labour have never been in sniffing distance. The Westminster result mirrors earlier council wins for Labour in the City of London where Labour won its first seat in the Portsoken ward in 2014 and then went on to win five seats -including one in the Barbican – in the next election. A similar surprising victory for Labour was in Harrow where Labour increased its majority to seven over the Tories. It was where it was won that made it surprising.Labour took Harrow on the hill – one of the poshest bits of the borough – that includes Harrow School and a private hospital – not normally natural Labour territory. The Labour candidates put on 1500 votes between them. And in Barnet amidst the carnage for some of the Labour councillors in Hendon – Labour did make a GAIN by two votes -ousting a Liberal Democrat in Childs Hill just north of Golders Green – in a diverse ward that included Jewish, Arab and Somali voters. And in Redbridge – Labour which made a double digit number of gains – included the new ward of Wanstead Village where homes can go for £750,000 – again not natural Labour territory. Outside London Labour did amazingly well in Worthing. Worthing has never had a Labour councillor since Harold Wilson’s second victory in 1966. Last year Labour won a seat in a by-election in the centre of the town. Last week it won another four council seats and came close in a number of others. They also gained three seats from the Conservatives in next door Adur – better known as Shoreham on Sea -while the Tories took two from UKIP. The MP for Worthing East and Shoreham , Tim Loughton, who has a majority of 5,106 over Labour should be worried. The reverse can be shown in Nuneaton which if the council had a full election – it seems certain Labour would have lost it to the Tories. Labour lost eight seats – some by big margins- in a result that gave the Tories 51 per cent of the votes on a 32 per cent poll. Nuneaton is 88.9 per cent white British with a large proportion of pensioners – immigration hardly exists – the biggest group are Poles -but it had strong support for UKIP. which has transferred to the Tories.The census figures showed it was overwhelmingly Christian with just 12 Jews and 2895 Muslims out of 126,000 people.Nearly two thirds of the population are working class – classified as C2, D or E.
This makes an interesting dilemma for Labour they are still gaining votes in areas that Tony Blair could not even dream about but equally they are losing votes in traditional English working class areas where they need support. But Labour need to progress in both old England and new diverse England to succeed. If there is any post mortem to be had after these elections – this is it. In the pre election scenario Labour were expected to sweep all before them winning Tory councils in London and elsewhere, Theresa May was going to face a dire night and the Lib Dems were not going to do so well because of their poll ratings. Yes Labour are partly to blame for creating this scenario with the promise of a Momentum style surge knocking the Tories out of Barnet, Westminster, Wandsworth and Hillingdon in London and winning Swindon, Plymouth and Trafford outside the capital. They had high expectations after the surprise rebirth under Jeremy Corbyn in the last general election and thought another heave would do it. But it would be very foolish to write up these elections as the end of Labour’s progress or ruling out a slow revival of the Liberal Democrats. 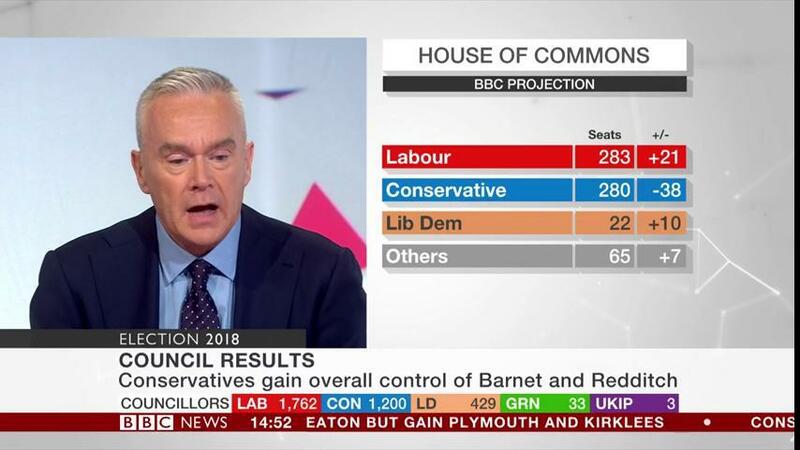 For a start the final analysis of voting by the BBC shows that if there was a general election was based on these voting figures Labour would have got another 21 seats, andbecome the largest party in Parliament . The Tories would have lost 38 seats and the Lib Dems gained another 10. If that had happened last year Theresa May would not have been able to form a government and it would be Labour plus a coalition that would be negotiating with Brussels. And if you compare it with last year’s council elections it was the Tories making nearly all the gains. not Labour. A more detailed analysis shows why this is true. Although Labour did not gain the breakthrough to take another four London boroughs from the Tories, their vote share was much nearer than their seat share. In Westminster where the Lab vote share jumped by 7.6 per cent – the difference in percentage support between Labour and the Tories is not much more than point. In Wandsworth there is only a 150 votes difference between the Tories and Labour running the council. Even in Barnet where Labour’s self inflicted wound over antisemitism led to a 13 seat Tory majority- the Tories biggest gains – the Labour share of the vote went up 2.8 pc but was trumped by a 6.6 per cent rise for the Tories. Also not noticed in London is that Labour increased the number of seats on councils they already run, notably in Ealing, Enfield, Harrow, Hammersmith and Fulham and Waltham Forest – which will make it difficult for the Tories to regain Parliamentary seats. In Swindon where Labour gained just one seat more people voted Labour than Tory but obviously not in the key wards. Interestingly in Plymouth where Labour won the council, more people voted Tory than Labour but not in the right places. Also where councils switched from no overall control to Tory control – it was often by a couple of seats in places like Peterborough. The one exception was Nuneaton and Bedworth where the Tories were robbed – they got 51 per cent of the vote there but could win enough seats to take the council. The other big factor which stymied Labour and helped the Tories was UKIP. Many UKIP voters became Tories so they could get a hard Brexit. In Basildon and Great Yarmouth this gave the Tories the edge over Labour. Labour did take back seats from UKIP, but the Tories took more. In Great Yarmouth former UKIP candidates actually became Tory candidates. Britain Elects shows this disparity examining 81 UKIP losses with the Tories gaining 47 seats from UKIP while Labour gained 30. It should not be a total surprise that the Lib Dems do well in local elections, they have won quite a number of by-elections over the last year. But in three councils- where the whole authority was up for grabs – they did spectacularly well, trouncing the Tories. These are South Cambridgeshire, Richmond and Kingston, where they won sweeping gains pushing the Tories out. They also won seats in Hull, Sunderland and Gosport but were pushed back in Birmingham and Newcastle upon Tyne. So what is the prospect? The Tories can take comfort that they were not trounced and could claim a mandate for a hard Brexit after hoovering up much of the UKIP vote. It is rather ironic that Theresa May treated councils she had not lost as a victory parade-normally you go to places to celebrate a Tory gain. Labour need to tackle the antisemitic issue promptly and to reflect soberly on how they need more than an incompetent government to form a majority administration. And the Lib Dems need to build on their local government base as a springboard to win more seats in Westminster. The reality for all parties is that it is going to be a hard slog to get or stay in government.